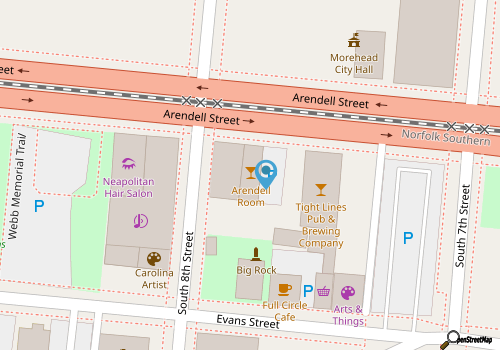 Morehead City visitors can enjoy a decadently elite and intimate bar atmosphere without ever venturing outside the downtown area with a visit to the Arendell Room. This posh little bar that’s found just off of Arendell and South 8thStreets is a dream for cocktail fans, and features a fun collection of drinks that are expertly crafted and always go down smoothly. The interior of the Arendell Room is warm and inviting, and just a little historic, with a stark brick wall that borders a wraparound wood bar with elevated seating. Behind the bar, patrons will find dozens of top-shelf liquors that serve as the basis for all of the Arendell Room’s cool concoctions. The motto of the bar is “cocktails first, questions later,” and patrons will soon discover that creating the perfect mixed drink is the most important order of business at this friendly but posh local tavern. By taking a culinary approach to cocktails and utilizing the best ingredients, like fresh squeezed juices and the finest spirits, patrons will enjoy an elevated taste of the Crystal Coast bar scene with every visit. From classic martinis to unique concoctions that are advertised daily on the in-house blackboard, the Arendell Room is the place to go for a fresh taste of Downtown Morehead City. Call (252) 240-2753 for current hours.